Having a child with any type of developmental disability can be very stressful for the parents and the siblings of that child. Siblings without Aspergers may be drawn into care-taking roles (e.g., teachers, co-parents). Many children find these roles difficult to fulfill because it takes away much of their own childhood and sets aside their own needs. For most siblings without Aspergers, having an Aspergers brother or sister becomes a central experience in their lives. They may see their Aspergers sibling as having the spotlight (not an easy situation for any kid). Thus, it is very important for parents to be aware of how the Aspergers child – and the sibling without Aspergers – may need to be nurtured in special ways. Often times, brothers and sisters are thrown together for better or for worse. When a sibling has Aspergers, it can complicate that relationship because one child lacks social skills and the other child simply cannot figure out why his brother or sister acts the way he/she does. 1. A child may need help in understanding what it feels like to be sensitive to touch or sound. A demonstration of metal scratching a chalk board could be used to show how sound can be unpleasant to their Aspergers brother/sister. 2. Children may become anxious about an Aspergers sibling’s future, and to some extent may begin to wonder what their own responsibility should be. Sometimes having an Aspergers brother or sister can interfere with establishing a sense of autonomy. The non-Aspergers child can feel guilty as she moves forward toward relationships, higher education or jobs, while the Aspergers brother/sister may be developing more slowly or struggling. The non-Aspergers child may feel like she is abandoning her parents as well. Reassure her that things are being taken care of, and that it is important that she keep moving forward in her own individual life. 3. Children may become competitive with - or critical of - their parents around how to best manage the behavior of their Aspergers sibling. Admit that you, the parent, do not have all of the answers. This admission provides an opportunity for a more realistic picture of parents as people coping, rather than as ‘superheroes’ whose achievements the child can never equal. 4. Don’t put the sibling in a parenting-role with the Aspergers child. Let her know that she can help or teach, but it is important for her to have different ways to interact that are also fun. 5. Don't accept bad behavior from your Aspergers youngster, and don't expect perfection from your other kids. 6. Fully educate yourself about your Aspergers youngster, and then inform his siblings on an age-appropriate basis. Know that Aspergers kids find it very difficult to pick up on social cues and often have intense, narrow interests. 7. Get some counseling from a mental health care professional. There is nothing wrong with allowing your children without Aspergers to receive extra assistance to help them cope with their Aspergers sibling. In psychotherapy, they can learn specific tools, build self confidence, and have a safe environment to share their thoughts and feelings. 8. Give children without Aspergers a balanced presentation of both the special strengths and talents as well as the challenges of the child with Aspergers. 9. Help your Aspergers child understand how his siblings think and feel, and why they behave the way they do. 10. In some cases, non-Aspergers siblings feel the need to be high-achievers in order to make up for the stress caused by their Aspergers brother/sister. Keep an eye out for this “perfectionism” and reassure the child without Aspergers that she can simply be herself (e.g., “It’s OK to do your best – but perfection is never a requirement”). 11. It is often tempting to coddle the Aspergers child and expect the other children to do so as well. Do not make this mistake. 12. Know that the Aspergers diagnosis should be disclosed to the child with Aspergers before it is explained to siblings. Once the child with Aspergers appears to be comfortable discussing the diagnosis with other family members, you can share the label with his brothers and sisters. Until then, use descriptive language, but no label. 13. 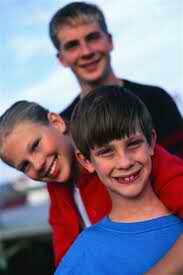 Know that the child with Aspergers will benefit and learn social skills from their siblings. They should be entitled to a reasonable amount of sibling rivalry. You don't want to deny the Aspergers child the typical childhood, which includes fighting over games and movies. 14. Let siblings know what the Aspergers child needs to the extent that they can understand, and provide as normal of an environment as possible. 15. Let your children without Aspergers know that it is all right to feel angry, embarrassed, jealous, neglected, worried, or any other feeling they might have about their Aspergers sibling. Emotions are not “bad”; siblings often have these feelings, and they are not “wrong” for having them. 16. Non-Aspergers children sometimes feel guilty that they have friends and their Aspergers sibling does not, and they may find themselves in a position of having conflicting loyalties between friends and family. If a sibling becomes protective when her Aspergers brother is teased, reassure her that she is not the only protector – it is the parent’s and teacher’s job as well. 17. Non-Aspergers kids benefit from opportunities to express their emotions about their Aspergers sibling’s special needs and behaviors. Useful activities might include reading books about Aspergers, making a book about Aspergers, or using puppets/dolls/stuffed animals to facilitate the expression of emotions. 18. Parents often find it is necessary to explain why their rules and expectations may be different for the child with Aspergers (e.g., the Aspergers child may be allowed to spend more time on the computer or less time doing homework). This may appear unfair to the other children, but it needs to be explained at a level they can understand (e.g., “Your brother needs special teachers at school to help him with homework…” or “The computer helps your brother calm down when he feels over-stimulated…”). 19. Realize just as you may grieve the loss of a “normal” child, the Aspergers child’s siblings may also be grieving, because they don't have the kind of sibling-relationship that other families enjoy. Let them talk about their feelings. 20. Seek support groups. Moms and dads in these support groups have other children too, and they can be a valuable resource for the siblings of your Aspergers youngster. 21. Set aside quality time alone with each youngster. One way to accomplish this is to take one child at a time on an errand or personal appointment when you can. 22. Some children may benefit from sibling support-groups. This can be particularly useful when the sibling does not know other siblings of Aspergers children. In a support group, the brother/sister has an opportunity to find out that he/she is not alone. Sibling support groups promote an atmosphere in which siblings are more likely to express negative feelings; they may feel safer to do so because they are in the presence of others going through similar experiences, and because they don’t have to worry about hurting or angering their parents. Siblings can also use the support group to brainstorm ideas about how to handle touchy situations with their “Aspie” brother/sister. 23. Sometimes kids believe that Aspergers is contagious. Reassure siblings that they cannot “catch” a case of Aspergers even though they are around their Aspergers sibling frequently – it’s not like a cold or the flu! 24. Sometimes kids blame themselves and engage in “magical thinking” where they believe that their actions or angry thoughts “caused” their sibling to have Aspergers. Thus, reassure siblings that having Aspergers is not anyone’s fault – it is simply something some people are born with. 25. The children without Aspergers need to be encouraged to pursue their own interests. This helps them focus outside the stress that having an Aspergers sibling may have on the family and helps them see themselves as more than so-and-so’s brother/sister. 26. The sibling without Aspergers may find herself in a situation where she has to explain to others the unusual behavior of the Aspergers sibling. After helping children to better understand Aspergers, they can be helped to learn to explain what Aspergers is to others. Moms and dads can help by providing opportunities for kids to rehearse or practice explaining (e.g., through puppets or role-play). 27. Understand that Aspergers is an "invisible" disorder. Siblings may be embarrassed in front of their peers when their sibling (who looks no different than any other child) can't stop blinking his eyes or making faces (tics). Siblings may think of their Aspergers brother/sister as simply naughty or rude – particularly if they are quite young and unable to fully understand the Aspergers-related issues. 28. When explaining an Aspergers child’s behavior to the other children, be sure to provide factual information and concrete explanations (e.g., “He plays the same thing over and over because he doesn’t think that it’s fun to try new things…” or “She’s flapping her hands because it helps her calm down…”). 29. When siblings witness cruel behavior towards their Aspergers sibling – or are the target themselves – it is imperative from the beginning that adults get involved. Siblings should be encouraged to share this information with trusted adults as soon as it occurs. Moms and dads can use this opportunity to discuss with all the kids in the family how to choose friends. Both the sibling and the Aspergers child will need to develop strategies with school staff for dealing with teasing/bullying. 30. "Family meetings" where parents and all the kids get together to discuss the week's events can (a) provide good insight to family members and (b) provide opportunities to problem-solve past issues and trouble-shoot potential future issues. I have a brother who was born in 1967 who I believe has Asperger’s. My brother began undergoing testing to determine what his problems were and how he could be helped when he was three. He worked with a speech pathologist, went to a local clinic for special needs kids and repeated kindergarten. My mother said his doctors could not find a suitable label for his disability so we just called it a learning disability. My mother got a master’s degree in Special Education in the 1980’s and my parents worked tirelessly on trying to improve my brother’s understanding of non-verbal language and his balance and coordination throughout the 70’s and 80’s. My parents advocated at the local, state and national levels, but when they weren’t around, I was my older brother’s policeman at school, church and in other social settings. We both had to cope with extensive bullying. My brother became a talker when he lived in Indianapolis and made good friends there, but moved away to try a PhD. He is still subject to embarrassing and explosive bursts of temper and awkward and painful falls. He knows everything about city planning and has a bachelor’s and two master’s degrees, but never had a serious girlfriend and cannot relate to his peers who are married and raising children. He successfully lived hours away from my parents for 12 or more years although he hated his government job. He has been living at home again with our parents for the last five years after having a disastrous experience trying to do a PhD in Ohio. He has a history of anxiety and depression and has had incidents of road rage with and without me in the car. At times, he has struggled with suicidal feelings also. He has barely worked full-time in the last five years and has had considerable difficulty re-launching his career after completing his second master’s. He hasn’t had a date in a decade. He applies for jobs all the time, occasionally gets interviews, but is not hired. I know part of it is the economy, but I’m concerned that he needs guidance he is not getting. I don't think his problem is a lack of motivation right now although he has struggled with that in the past. My parents are in their 70’s now and we live in Oklahoma while the rest of our relatives live in Indiana, so there isn’t much extended family support. Neither my brother nor I are married with children. I want my brother to at least have a work life he can be proud of that will pay his bills and I deeply desire for him to not feel so socially isolated. I’m scared that he will be more than I can handle when my parents pass away. Because he has so much formal education and once worked in a career position and even helped a mayor in Tulsa get elected, I don’t know if the techniques in your book will be helpful to him or if he will even be open to them. My parents over-parented him and I think he is showing the fallout from that. Do you even think I am on the right track? He says he doesn’t worry much about his learning disability, but I am concerned that out of ignorance and good intentions, my parents gave him extremely unrealistic expectations for his life that are dangerous for him now. My mother acknowledged that he may have Asperger’s. His physical coordination never improved despite years of coaching him on it. His social awareness improved along with his communication skills, yet he has few friends and rarely feels understood. He was exempted from registering for the military at age 18 by his clinical psychologist and pediatrician and was allowed to take college entrance tests un-timed. He is still extremely slow to complete tasks and has crippling perfectionism that keeps him from taking risks. Should I press for him to be evaluated by a clinician for Asperger’s? Should I attend a support group for siblings of those with Aspergers? Are there any services or groups that might help him since he is an adult and is, in fact, approaching middle age? He has already received years of counseling with different people. Or would a definitive Asperger’s diagnosis really be helpful to him? I have often thought that it might help for him to matter-of-factly state in job interviews and in social situations that he has Asperger’s because generally, people just think he is weird, underestimate his intelligence and then avoid him or exclude him. YOur story of having an asperger sounds a bit familiar. My mum never challenged my brother, RObert as she was afraid he'd cut off all communication like he did my grandmother and others at times he didn't get his own way. So my Mum grew up afraid of 'upsetting RObbie'. She had no trouble upsetting me. Since my Mum died, he has gone haywire. Accused me of poisoning my mum (she died at my place), saying I'd stolen my mum's jewellery when I took it out of her empty house (despite me telling our solicitor and my brother I was doing so). He refused to talk to me for months, until he wanted something: to be given control of the Estate I had to go to court to get (he appointed a State Trustee who would have charged $500,000). I asked my brother 3 times to administer the Estate by himself, but he was not responding to anything I emailed to him. He's now demanding all these powers he doesn't have. I'm being polite of course, but just want to tell him "piss off - you've had your chance and you refused so bad luck". This certainly has been an interesting year. Having his way in our family all his life hasn't helped him. Plus he's married to a bitter asperger woman who thinks I'm the devil incarnate (on first meeting 15 years ago). She's overweight and unattractive and I'm not - maybe that's why. Life strange hey? I'm glad to accept he's never going to want a relationship with me - quite frankly (after many tears and self-doubts for months on end) that's a relief. He's done me a huge favour & letting go is hard - but once you do it - very freeing. I have a step son that was just recently diagnosed with aspergers syndrome. The psychologist also said he has a severe learning disability. He has "episodes" roughly once a week. Usually when he doesn't get his way. He also threatens to kill himself if he doesn't get his own way. He has always been very manipulating and his father is constantly coddling him. He will "blow up" and then be fine. He has an episode like that and then his dad will go and buy him a new violent video game. When the other kids see this they get upset because he doesn't get them anything. He doesn't make him follow the rules of the house like he does the other kids. And he says if he has a good week at school or gets through this or that that he will reward him with a new game. I don't believe that he has been diagnosed correctly and his father won't acknowledge my feelings. He is 13 and has been in and out of pcychiatric hospitals and juvenile detention centers over 10 times combined. It is taking a toll on my marriage. The psychologist said that he should be supervised when he goes for walks and bike rides. But his father just lets him go and hopes nothing bad happens. I have offered to go to counseling with him and my husband but the request just falls on deaf ears. I'm at my wits end with the whole situation. If anybody can give me any insights on what I should do I would be receptive to any ideas. I grew up as a kid with a 3 years old Aspergers brother (I'm a girl). I never understood why my brother did the things he did- he was extremely violent to the point I have repressed most of the memories of my parents and I being hurt, had no friends, and had the strangest obsessions that would last for a few weeks and disappear as fast as they came. I realize now, many years later, that he has Aspergers. Nobody explained to me as a child. My parents tried to pretend he was normal and never properly dealt with him the way he should have been. Throughout my childhood I tended to be neglected why they gave extra attention to my brother. This led me to feel like I had to be perfect all the time, and led to a lot of mental issues for ME in the future such as severe depression, loneliness, and the inability to trust any other person. All I'm trying to say in this post is that if you as a parent of an Aspergers child is reading this, please take what this article says to heart. If my parents had followed the advice in this article, my and my brother's lives would have been A LOT easier and a lot less painful. Aspergers is not a disease to ignore. Regarding the other child(ren), make sure not to give less attention to them because they're "normal" and don't lie to them about the other child's condition. It will lead to future problems within the family as a whole. My 6 year old sister has aspergers and i am 12. It it so hard to deal with how she acts. Sometimes i get yelled at for her actions. Sometimes i just wanna run away. Mr.Gavin, I totally understand everything you wrote. It's hard to understand and keep forgiving but you are such a good big brother for trying and doing so. You are such a good big brother. Something my mom has always told me is that you have to take all those good memories that you may have with your sister and when she or you are having a tough day, remember them. It makes it easier to know it isn't always like this. You see, your sisters brain and your brain are wired differently. You both see the world in complete different ways. It's okay to feel everything you're feeling. I'm 19 and feel what you feel. You are such a good big brother, you don't even know it. This was useful, to see all the things I felt were lacking in how my parents dealt with me and my sister were true, real things that I needed. I hate that my brother has aspergers, he is 18 now, two years older than me. I know were not supposed to say that, but he is intolerable. He just had one of his episodes and locked me out of my house after tackling me down and cruushing me. He tortures our pets and anytime something doesnt go his way threatens to either leave o r hurt himself. My dad cant control him at all, and he will only ever listen to my mom. They only recently diagnosed him, so it has been very weird for me to suddenly have to understamd that everthing he does is not actually his fault. Ever since I can remember I have been an over achiever, and have had many other of the problems that this article talks about, which I wish had been used with me when I was younger. Everyday is a gigantic struggle, and it just seems so unfair, I too wish that I could just run away sometimes and not only feel like I am disappointing my parents every day. I have a twin brother with aspergers. I feel alone , like no one understands how it affects me. My parents say they understand but they don't. I am to the point where I feel like I don't even have a brother anymore, I just have a person in my house who alway starts fights and is mean to me. We do the same things and have the same friends and its just too hard. He has this hate for me that I don't understand because I am very nice to him! I just feel alone and overwhelmed! Hi, my name is Louis and i'm 15. My 16 year old brother has asperges. This evening I got into an argument with him about moving something. In the end I let him win and I left the room. I went upstairs and went onto my computer and did something accidentally​ which turned off this item (it connects to my PC), whilst he was using it. I heard the door slam downstairs and heard him running up towards me. I got scared so I ran to the bathroom to lock myself away from him, it was too late. He beat me up violently. My parents blamed it on me for whining him up. I need advice. Please. If I were you, I would contact your local authority for protecting children under 18 from abuse and I would report that it's an unsafe house for you and show them your injuries from getting beaten up.